I like making most of my pages digital, because I don’t have to worry about them getting ruined, or lost, or destroyed so much. But to be honest, I don’t print pages (or books) very often, and when I do, I keep them in a special place, because good quality prints can get expensive. But my kiddos REALLY like to look through the memories. So, a few years back I started making a physical book for each one of them. Just something small and simple, printed out at home, or for a good price locally, that they can call their own. Sometimes they help make pages, sometimes they just watch, but they always know that the pages that go in those books are THEIRS! Just for them. They can take it to bed, carry it to school, whatever. And they LOVE it! My youngest just turned four last month, and has really been homesick lately (we moved from Thailand to the US in mid 2016). So, I started pulling together some pages of him back in Thailand to go in his book. I hoped it would help him process his homesickness, and learn new vocabulary for the feelings he has been experiencing. When Cheeky Monkey came out a few weeks back I KNEW I had to use it in his book. He has always been our little monkey – from his climbing on everything and endless energy, to the lovey he has had since he was born (which is a blue monkey). Plus, I LOVE the bright and happy colors in the kit, because bright and happy is what we all need right now!! For these pages, I decided to use the Pocket Cards. I had some left-over pocket sleeves from our travel book this summer, and I already knew which pictures from Thailand I wanted to use with them. I have been trying to curate happy memories of the best parts of our life in Thailand, combined with messages of love and reassurance for the little guy as he adjusts to life in the US. This first page is a memory from one of our weekly shopping stops. A bakery store with a coffee shop. We would often stop for a snack once our shopping was done, and we have many happy memories there. 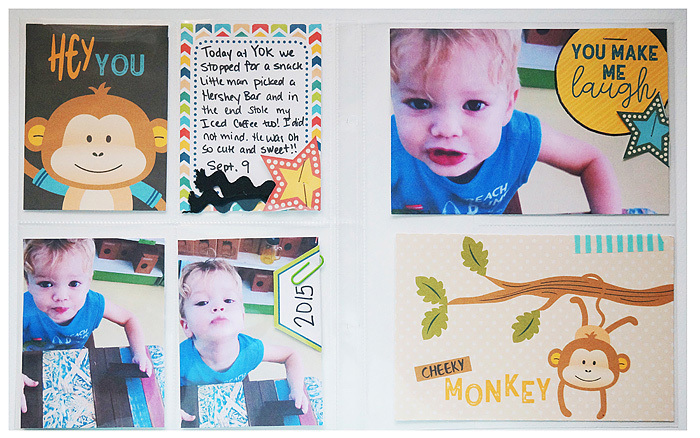 I really like how the colors of the kit echoed the colors in the photos, and my son loves the MONKEY! As we look at the page together, he is able to tell me what he remembers about the shop, and I tell him stories of our different adventures there. The second page is just a message to my son that he really is a cool fellow. Something that we can all forget when we get down. 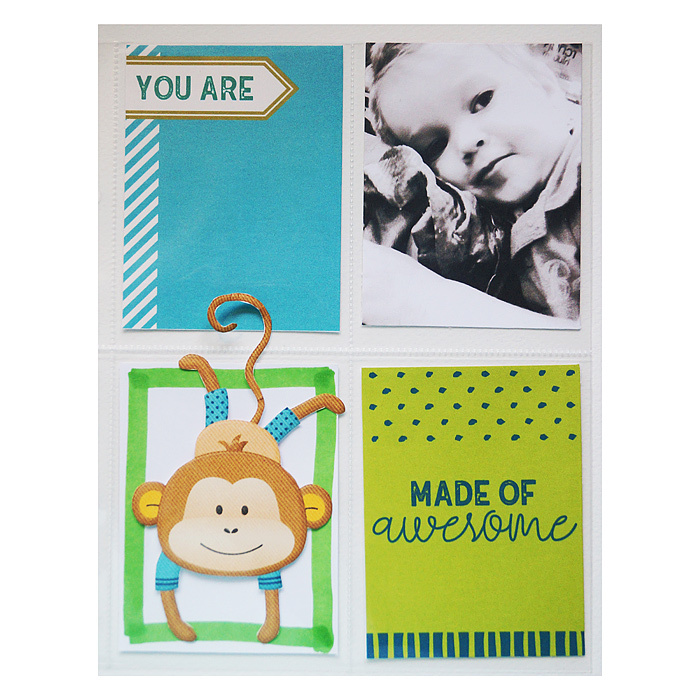 He really wanted the monkey to be on this page too – so we made our own little card using the monkey element from the kit and a marker on a piece of white card stock. Super simple, but his favorite part of the page. Have little people in your life? 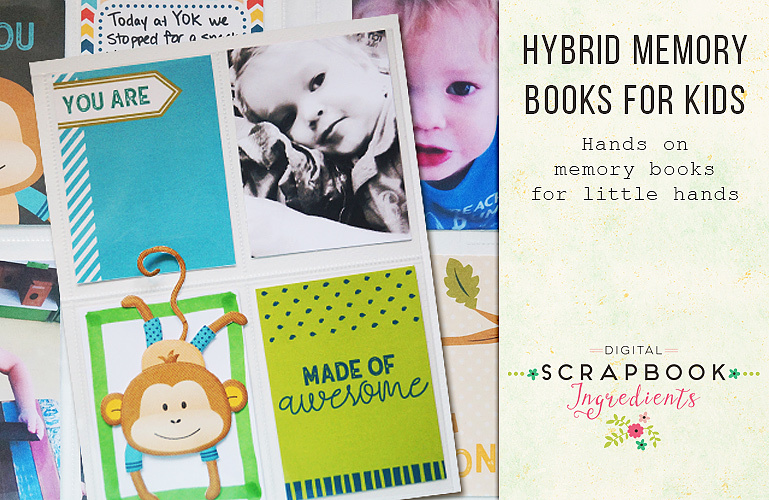 If you are ever looking for a simple, but treasured gift idea, go for a memory book! You might be surprised at how much they love it!